If your Tripawd lost all mobility and became paralyzed, would you know what do to? Most of us would panic and get depressed but thanks to one special paralyzed dog named Sophie, there’s a place we can turn to for advice and hope. 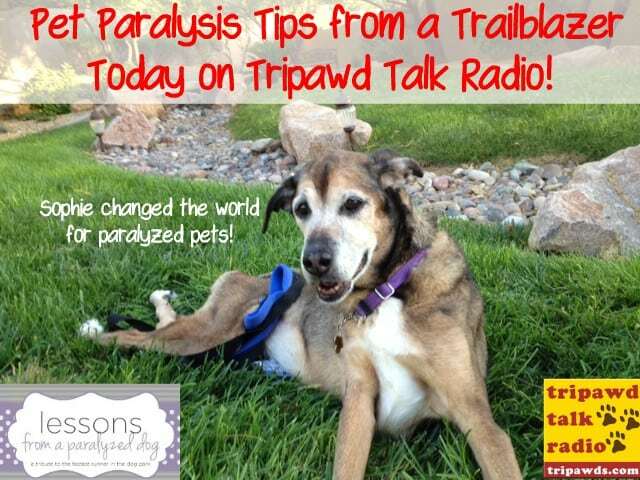 Today on Tripawd Talk Radio we are happy to welcome back Sharon Seltzer, founder of the website Lessons from a Paralyzed Dog. 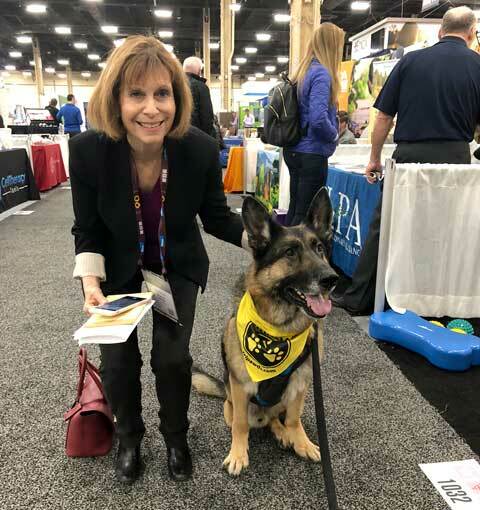 Nobody ever expects to hear a paralysis diagnosis from their veterinarian but that’s exactly what happened to Sharon Seltzer, when her dog Sophie started having mobility issues at age 10. The active shepherd-mix dog went from running with the pack to being diagnosed with a progressive paralysis that took away her ability to run, walk and later stand or even sit on her own. “But we continued to have life! She lived happily for another five years,” says Sharon from her Las Vegas home. “At that time veterinarians were not that encouraging,” she recalls. “Ultimately Sophie was still the same dog that I had known for the past 10 years, and the same dog that we had loved.” Euthanasia was not an option. “We went around making those kinds of changes, and it took a while and was kind of nervewracking at first. But you’d be surprised at how once you get going it becomes a normal routine. It’s just something you do. It’s your normal way of life,” says Sharon. 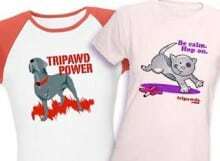 From expressing a dog’s bladder, to playing tug-of-war with the pack, to going on walks, in this episode of Tripawd Talk Radio you’ll get the day-to-day details of creating a happy world for a paralyzed dog. You’ll find many of the aspects of living with a paralyzed pet are similar to helping a pet through amputation recovery. Sharon started the Lessons From A Paralyzed Dog website in November 2013. Today it’s the number one resource for pet owners caring for a handicapped, paraplegic or other special needs dog, cat or other pet. Sharon provides her most important lessons about paralyzed pets, tips, support, news and where to find products for the daily care of pets with paralysis and other neurological conditions. Thanks to her trailblazing work and special needs pets advocacy, the world is more accepting of pets with limited mobility! Sit back and tune in, since many of the tips discussed will prove helpful for pet parents helping amputee dogs and cats love life on three legs, especially with giant breed dogs or during the early days of recovery.